ST. LOUIS — St. Louis put on a great show for the 2017 Winter Classic. 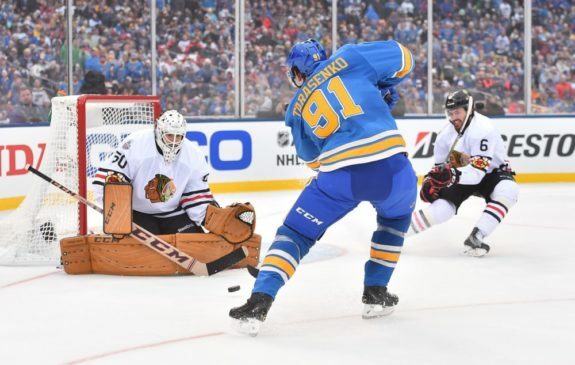 From the production and spectacle to Vladimir Tarasenko scoring two third-period goals to give the Blues the win, it was a fun event, even if it didn’t carry the overtime dramatics of the Centennial Classic on New Year’s Day. The game was close to being delayed by rain, but it never came to that. The game went on as planned and the ice cooperated, making sure Roberto Luongo wasn’t subjected to vicarious sadness. Here are the six best moments from the 2017 Winter Classic. Top players are able to rise to the occasion and Tarasenko was no different. He had opportunity after opportunity in the second and third periods, including a breakaway opportunity. You could feel that the dam was going to break at some point. And it did. Tarasenko scored two goals in a minute and two seconds to give the Blues the eventual game-winner and an insurance policy. How about a look at the first goal? “It wasn’t on purpose,” he said. Chicago pulled Corey Crawford and the Blues managed to hem them into their own zone late in the third. It forced Seabrook to scramble in front of the net and play goaltender. He made three saves before the team cleared the zone and kept play going. It wouldn’t matter in the end. Alexander Steen eventually potted an empty-netter to seal the 4-1 victory for St. Louis. For Monday’s game, coach Ken Hitchcock came out with a fedora that probably won’t take the fashion world by storm. Before the game, St. Louis native Nelly — yeah, that Nelly — performed in front of Busch Stadium. NBC’s Bob Costas went for it with a segway between the rapper and hockey. It didn’t go great. Unless you love awkward things. If that’s the case, this went super well. The Mad Men star was at Monday’s game and made a brief appearance alongside Jeremy Roenick on the NBC broadcast. Brief as it was, he still found time to remind Roenick that he never won a Stanley Cup. That’s the kind of ribbing a former Blackhawk should expect from a Blues fan. They stayed for the entire alumni game on Saturday when most stadiums empty and they tossed on ponchos to fill the stands Monday despite the rain. It was a fantastic atmosphere. Everywhere you went over the weekend there were fans in Blues jerseys. That was even true at 8:30 a.m. before the game when Blues-clad fans were already having a beer across from the stadium. 2016 was a year where St. Louis hockey loomed large, from a solid showing by the Blues to the huge St. Louis presence at the 2016 NHL Draft. As Team USA was getting ready to start the quarterfinals of the World Junior Championship captained by a kid from St. Louis, the city itself celebrated its hockey heritage with Brett Hull and Bernie Federko and Wayne Gretzky and Chris Pronger and Vladimir Tarasenko and Kevin Shattenkirk. “The team and the sport and the game itself in St. Louis is probably as strong now as it’s ever been,” said Gretzky after the Alumni Game. The weekend was a well-deserved celebration.